Isla Holbox is part of the Mexican state of Quintana Roo, located in the north west corner of the state where the Caribbean Sea meets the Gulf of Mexico. This Holbox island was founded by pirate descendents in the year 1873 AD. The name, Holbox, in Mayan means "Black Hole". The primary means of earning a living then as well as today is by fishing. The produce of the seas has sustained this treasure over centuries. Over time Holbox island has slowly gained entrance into the world of tourism. 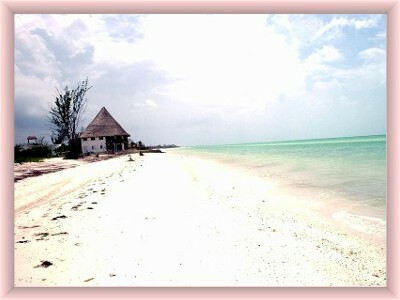 Holbox Island is 40km long and 2 km wide with 34 km of white sandy sometimes isolated beaches. The northern side is primarily beach while the south side is primarily mangrove and wildlife sanctuary home to a diverse amount of wildlife. 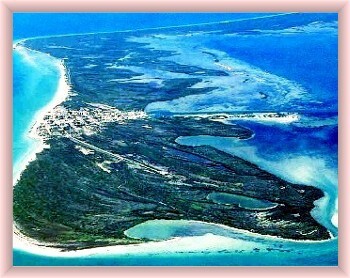 Most of Holbox island is unreachable other than by boat and remains uninhabited. A refreshing sea breeze is constantly blowing. Isla Holbox Ariel Shot Town in the middle. The center of town is the town plaza or square. Here in the "zocolo"( Spanish word for plaza) you will find the center of activity of the island. The town's basketball court, child's play park, the Catholic church, the police department and city hall as well as several restaurants, small guest lodgings, Holbox island's internet shop and several small grocery or "general" stores surround the square. Important Information Please Read ! Holbox Island, like many places in Mexico, will celebrate the "Carnaval"or pre Lent festivities so common in very Catholic countries. Carnaval takes place the weekend before Ash Wednesday ( the beginning of the Catholic period of fast called Lent) and will go to Fat Tuesday, the night before the 40 day fast period begins. Usually in Feb or early March) Isla Holbox has a small parade, music and much excitement for those who wish to celebrate Carnaval in a small town. The Holy week period is a traditionally very busy time on Holbox island simply because it is a traditional Mexican travel time and schools, factories and businesses are closed. Locals and those from afar enjoy the island during this two week period of vacation. Every April 14 the Day of Saint Telmo is celebrated. This is a small island fest part of tradition that has lasted over decades. Dancing and traditional food for all..
May 13 is the Day of the Heads as well as the Virgin of Fatima day. This day is celebrated with dances, drinking, and eating of pork. The head of the pig is part of this days celebration. The whole island comes out and enjoys this fest and you will too if you are on the island for it!! 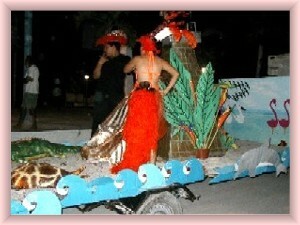 The month of June is when the annual party honoring the settlement of the Holbox island community. In 2011, Isla Holbox had a growth spurt.. The island now has a movie house, which is part of a mall type place right in the main down town area. The new town square or zocolo. As Isla Holbox is a hidden quiet relaxing place off the Yucatan, many tournament is held. Here both parents and children can participate together and go for the big one!! 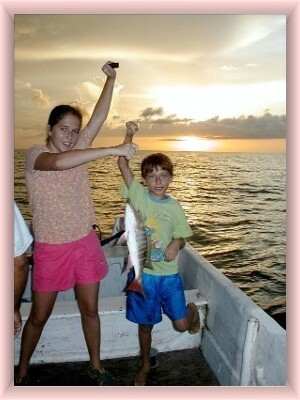 Isla Holbox fishing for the family Tatiana and Zak with their catch!!! Take Highway #307 to Puerto Morelos. Here you will see a road indicating the different cenote adventure trips. This road is a shortcut which goes through a dense jungle area, but avoids all the traffic of Cancun area. This road is just south of Morelos with exit on south side of highway # 307. Entrance gate is pictured below. Entrance Arch where you turn off for first short cut . Take this to and through the town of Leona Vicario and at end of this road you will join highway #180 old road heading west or toward Merida. Take this till the four way intersection in Nuevo Valladolid. At this intersection turn right and again you are now on another short cut which will go through three different Mayan villages. Be aware of the "topes" which are speed bumps. At the end of this road you will join the road that goes into Kantunil Kin and then continue on to Chiquila. In Chiquila there are several parking areas to leave your car. IF coming from Merida follow roads to Tizimin and then onto Col. Yucatan and finally into Kantunil Kin. Q.Roo state map. Both short cuts are marked on this map. Buses from Cancun downtown bus station depart only twice a day, at approx. 7:15 am and then at 12:15 pm. Trip to Chiquila is approx. 3.5 hours; cost approx. $120 pesos Buses from Merida depart main bus terminal in Merida once a day ( night ) about 11 pm and take approx. 6 hours. Best to always check ahead of time as time tables subject to change as are prices. There is now a direct ADO bus from Playa del Carmen to Chiquila departs daily at 9:15 am from main ADO terminal in Playa near the zocolo and takes about 2.5 hours. Cost is approx $220 pesos. Ferries from Chiquila to Isla Holbox depart frequently throughout the day, generally every two hours from 7 am to 7 pm with the last crossing about 9:15 pm , and current cost is $120 pesos. Recently a second company has started ferry services and thus the introduction of competition has increased the hours of service. Boat trip takes approx. half hour. For more information or reservations, please email amigosholbox@hotmail.com Thank you, FRIEND! Come visit Isla Holbox soon! !